It's happening folks! Mobile money is maturing in Pakistan. Chankaya: "Mobile Banking In India–$350 Billion Worth Of Transaction Expected By 2015 : NextBigWhat"
This is a highly optimistic forecast for India made in 2011 which has so far been proved wrong....it's likely many other highly optimistic forecasts for India that have not materialized as its economy has slowed considerably. 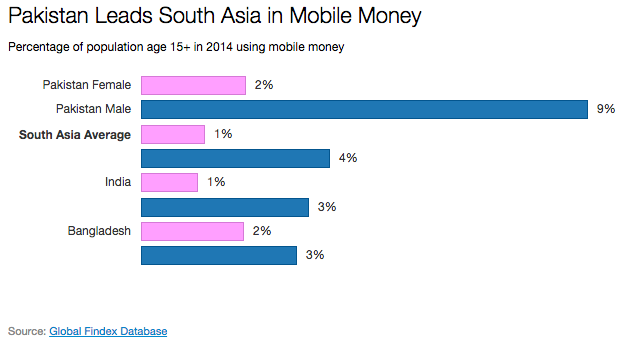 The use of mobile money in Pakistan appears to be gaining ground, based on supply-side data. The most recent quarterly statistics gathered by the State Bank of Pakistan  showed a 4 percent increase by volume and a 5 percent rise in the value of transactions from the previous quarter, continuing a fairly steady upward trend. However, from a demand-side perspective, uptake remains modest. InterMedia’s Financial Inclusion Insights team conducted a nationally representative survey of 6,000 Pakistanis in late fall 2013 to assess access to and use of mobile money and other financial services. The survey showed only 7 percent of Pakistanis had used mobile money at least once. The survey also confirmed the predominance of over-the-counter (OTC) transactions which are conducted by a mobile money agent on behalf of a customer. Ninety four percent of mobile money users only use OTC mobile money services, while 6 percent have a registered account and can use either the account or transact through an agent. Why is mobile money uptake low? Thus, 38 percent were not aware of mobile money products at all. This group had some demographic particularities. Forty-three percent of female respondents fell into this category, compared with only 28 percent of male respondents. Geographically, Punjab fared better than other provinces in terms of awareness about mobile money companies; only 25 percent of the respondents from Punjab could not name any mobile money company. This is logical, given that Punjab is a relatively developed part of the country and mobile phone use is high there. Punjab’s 25 percent stands in contrast to the 65 percent of respondents from Balochistan, 55 percent from Sindh and 35 percent Khyber Pakhtunkhwa, who were unaware of mobile money companies. Television ownership also tends to increase awareness about mobile money companies. Among respondents without a TV in their home, 57 percent could not name a single mobile money company, compared with 31 percent of respondents whose households included a TV set. Even among nonusers who are aware of mobile money, nearly half (49 percent) said they do not have a mobile money account because they don’t need one, which is, of course, a legitimate reason. However, the FII survey also indicated that 39 percent of non-users who are aware of mobile money were not able to identify a single mobile money function. It raises the question of whether some Pakistanis currently believe they don’t need mobile money simply because they don’t know what they might be able to do with it. We can’t answer this question directly from the survey data, but it does provide some clues about knowledge gaps that may act as barriers to usage. Even among those non-users who could name at least one mobile money function, the table below shows that the bulk of this knowledge focuses on person-to-person money transfers and, to a lesser extent, paying bills and buying airtime pop-ups. Other potential functions get little recognition. 'Super Power' India ranked 143 among 162 countries on peace index,Indigenous Maoist movement observed to be the biggest threat to her security. 'Failed State' Pakistan ranked 154. Buddhist-majority Bhutan the safest south-Asian country. ISLAMABAD: Pakistan has potential to lead to transform into a cashless economy by shifting from conventional mode of cash payments to electronic ones, which now have becoming preferable for being cost saving, transparent, speedy and secure, Managing Director Better Than Cash Alliance, Dr. Ruth Goodwin-Groen said. Dr. Ruth, while talking to a selected group of journalists here said that the United Nations-backed alliance would ask Pakistan to join the group, which already has over 30 members, while the registration of several other countries is in process. She said that Pakistan has tremendous potential to exploit as just 10 percent of its population were utilising banking services and 90 percent were still away from these services. The Better Than Cash Alliance is UN-housed alliance of governments, the development community and companies, committed to empower people by shifting from cash to electronic payments. The alliance works closely with World Bank, the Consultative Group to Assist the poor, the World Economic Forum and is an implementing partner of the G20 Global partnership for financial inclusions. Talking about the benefits of the alliance, Dr. Ruth said that the biggest generators of payments globally, estimated offer US$40 trillion in 2009, with millions of people in developing countries receiving salaries benefits and pensions through government-to-people payments. She said that the financial services are often difficult and expensive to provide to poor people at scale. As a result, most of these households are forced to subsist almost entirely in an informal, cash-only economy, making it difficult to save for the future, build assets and move out of poverty. She said, when governments shift payments from cash to electronic distribution-for example on mobile phones or by prepaid cards-there are lasting benefits for people, communities and economies. She said that the electronic payments decrease costs and increase efficiencies, citing example of Mexico, where the government trimmed its spending on wages, pensions and social welfare by 3.3. percent annually, or nearly $1.3 billion, by centralising and digitising its payments. She said that electronic payments are more transparent, increasing accountability and tracking and reducing corruption and theft while these are typically safe and have faster delivery. She was of the view that electronic payments can also accelerate access to and use of financial services and can also open doors for new business models for previously excluded people and create additional benefits. HBL signed agreements with MasterCard and Monet for the rollout of the first Mobile Point-of-Sale (mPOS) service in the country. The signing ceremony was held at HBL’s head office in Karachi between Mr. Faiq Sadiq (Head – Payment Services, HBL), Mr. Aurangzaib Khan (Country Manager – Pakistan & Afghanistan, MasterCard) and Mr. Abbas Sikander (Chief Executive Officer, Monet). The mPOS solution that HBL is launching will enable micro and small merchants to accept credit, debit and prepaid cards as payment, and can also integrate with the complex back end systems of larger retailers to provide a robust mobile POS solution. The mPOS technology “Swipe2Pay”, powered by Monet, is a low-cost solution which will help facilitate fast and secure card payments and drive card acceptance across the country.